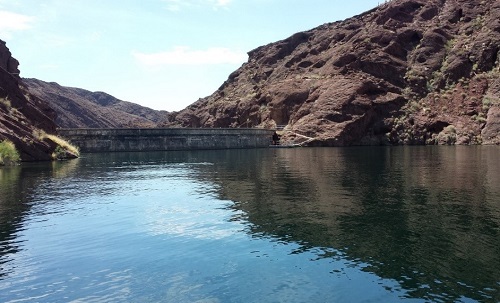 Dam Breach Analysis of Diemer Reservoir, Copper Basin, and Gene Wash Reservoir (CA) | WEST Consultants, Inc.
Dam breach inundation studies were conducted for the R.B. Diemer Filtration Plant Mixing and Settling Basin No. 8 in Yorba Linda, CA and the Copper Basin Dam and Gene Wash Reservoir, both located near the Arizona border in San Bernardino County, CA. All three dams are under the jurisdiction of the California Department of Water Resources, Division of Safety of Dams. Site visits were conducted with Metropolitan Water District of Southern California personnel including an airplane fly-over of the dam, spillway, and surrounding area for the Copper Basin and Gene Wash sites. An HEC-HMS model was developed for Copper Basin and Gene Wash for runoff hydrograph estimation based on San Bernardino County hydrology manual standards. The probable maximum precipitation was estimated following HMR No. 58 methodology, which provides calculation procedures for PMP estimation in California. The 6-hour local storm, 24-hour CA general storm, and 24-hour arid SW general storm scenarios were identified as potential “worst case” for dam breach modeling. HEC-RAS Version 5.0.3 was used to model the dam breaches and the subsequent downstream inundation. The 2D feature of HEC-RAS was used due to the complex downstream flow paths and to accurately account for the 90 degree confluence of Copper Basin Wash and Colorado River. The basins were assumed full to the spillway level as an initial condition. National Weather Service guidance was used to determine the breach parameters for the dams. In the case of Diemer, which is not technically a gravity dam, WEST investigated alternative breach times and failure of entire structural wall sections. Peak outflows were confirmed to fall within the acceptable ranges published by the California Office of Emergency Services. In addition to the inundation map for each site, HEC-RAS result graphics were prepared illustrating the maximum depth, maximum velocity, and arrival of wave front (time to one foot depth), relative to the onset of the breach. The studies were prepared in a manner consistent with the requirements of the California Emergency Management Agency.